Welcome to another post in the brilliant series by MikaelinhoFM. If this is the first post you are reading and want to read the series from the beginning, I would highly recommend it. Mikaelinho writes in a fun and engaging storyline style so you don’t want to miss any posts! This series follows the career of manager Marcus Allback and several key characters dating back to the Swedish Mafia days. Now for Part #9 of Sexi Brexi. What has Angry Tony Pulis been up to at Stockport? 19-year-old Scottish (!) attacker Johnny English, who came in for free after being released from Man City last season, suddenly started to attract the interest of Championship and Premier League clubs, pretty much out of the blue. He had been mostly used as a sub and hadn’t really impressed in his ten games for Stockport, with a tally of two goals and two assists. Aston Villa came in with the first bid at €775K and after a bidding war the final price tag landed at €2.5M, which is the biggest sale in the history of the club. With an abysmal ATP score of 46.3 at his best position as Pressing forward, Angry Tony Pulis was jubilant when the sale went through. “Good riddance. Now we can buy real players. Real men. Real butchers” he commented. The transfer window also saw central midfielder Connor Dimaio leave the club. After having to face the fact that he had gone from important player to bench player and occasional sub he wanted a new challenge, a request neither Allbäck or Angry Tony Pulis felt they could deny him. He left for Burton in a €65K deal and as a result young midfielder Sam Jutkiewicz (Leadership 12, Teamwork 17) was appointed new vice-captain. 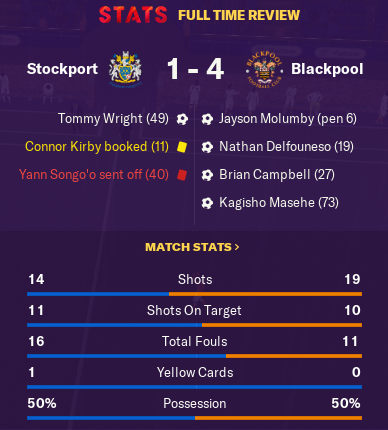 Yann Sango’o debuted in the team’s most abysmal performance of the season, losing 1-4 at home to bottom of the league Blackpool. Sango’o got a straight red card after a violent tackle just outside of the box at the end of the first half, hurting a Blackpool player in the process. Marcus Allbäck was furious while Angry Tony Pulis was raving. “What a debut! Sango’o displayed a will seldom seen at this level and he will be crucial in our attempt to reach promotion. We have certainly signed a true star!” he commented the player’s performance at the post-match press conference. 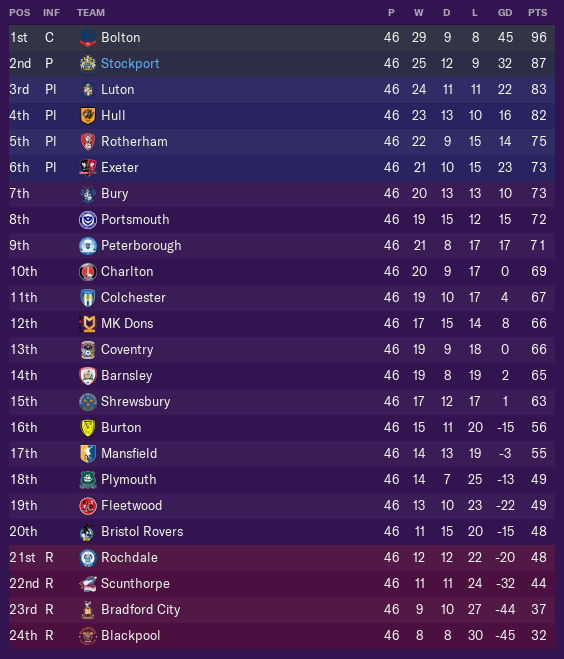 With 3 games to go the team were 7 points ahead of Luton in 3rd place. With a much better goal difference, one win or two draws was pretty much all that was needed in the final three games. The first game against Rotherham ended in a 2-0 loss after Sam Jutkiewicz got his 4th red card of the season. Marcus Allbäck was furious again while Angry Tony Pulis high fived Sam as he left the field. In the second game the team managed to secure promotion after a 1-0 win against Mansfield and both Manager and Technical Director rejoiced. Marcus Allbäck was happy because he had achieved the unlikely feat of reaching back-to-back-to-back-to-back promotions, taking Stockport from the Vanarama North to the Championship in only four years. Angry Tony Pulis was happy that he had managed to turn this sad bunch of sissies into real men and got them playing some proper British football in only a couple of months. 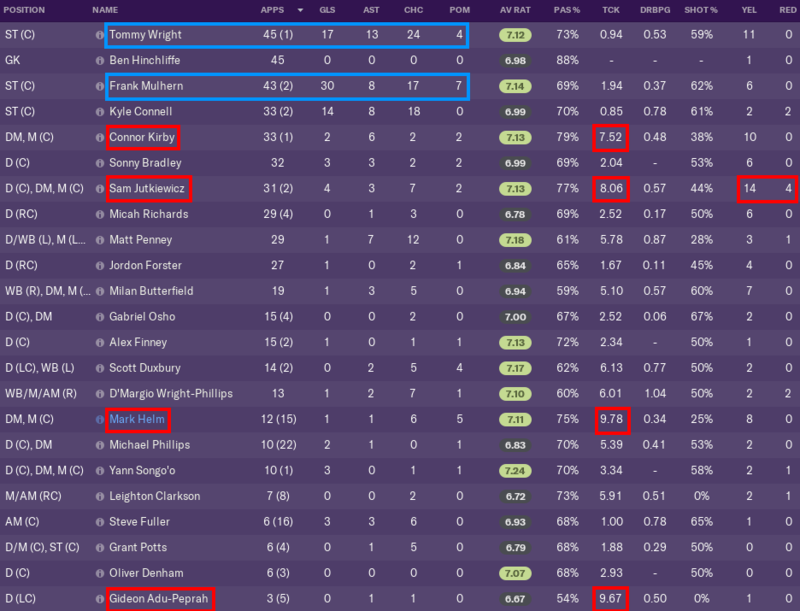 After a fantastic first half of the season, the second half saw the team struggle significantly more, even though it was enough for promotion in the end. For the first time in four seasons, teams started parking the bus when they played Stockport which suited the Sexi Brexi tactic really badly. 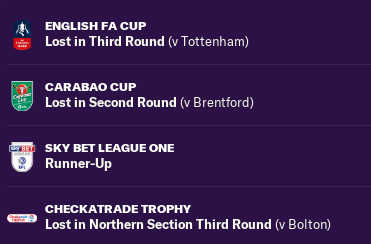 For once the Stockport team actually had decent cup runs. After winning the group in the Mickey Mou…sorry Checkatrade Trophy, Bolton became too tough in the first knockout round. Tottenham won a surprisingly tight game in the third round of the FA Cup and Brentford proved a size too big in the Carabao Cup. Just like the last couple of seasons dynamic attacking duo Wright and Mulhern were the true stars of the team with 47 goals and 21 assists between the two! Sam Jutkiewicz with 8.06 tacklings per game and a staggering 14 yellow cards and 4 red! Mulhern won Top Goalscorer and Marcus Allbäck won Manager of the Year. Had there been a prize for angriest manager of the year, Angry Tony Pulis most likely would have won it. Despite struggling massively against the bus parking teams Stockport managed an unprecedented feat of back-to-back-to-back-to-back promotions. Now they’ve reached the Championship, surely the saga has to come to an end!? I’m one of the guys participating in NewgenFM’s Achievement Hunter Challenge. With the record sale of John English we’re finally able to tick off our second achievement. A couple more are just around the corner so hopefully it won’t be another three seasons before I finish my third one!